Moldova's parliament has dismissed the government, following a no-confidence vote - a move which intensifies the country's political turmoil. Prime Minister Valeriu Strelet has been in office for less than three months. The vote, triggered by socialist and communist opposition MPs, followed months of big anti-corruption protests. 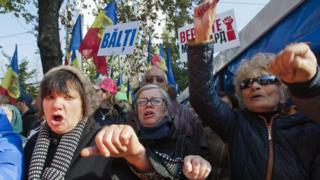 Many Moldovans are furious over the disappearance of more than $1bn (£646m) from Moldovan banks. The protesters are demanding early elections. A former prime minister, Vlad Filat, was detained earlier this month over his alleged involvement in the bank fraud - an allegation he denies. The no-confidence motion was backed by 65 lawmakers in the 101-seat legislature. Moldova is one of Europe's poorest countries. The missing money is equivalent to an eighth of the ex-Soviet republic's entire GDP. The scandal caused a rapid fall in the value of the national currency, the leu, hitting Moldovans' living standards. Mr Filat was accused of theft from the state-run Banca de Economii. Earlier parliament had stripped him of immunity from prosecution.